But there is no joking about the way a priest, a rabbi and an imam in Germany are planning an interfaith miracle in the heart of Berlin, creating a sacred space for the three Abrahamic faiths under one roof. The House of One is planned as a shared place of prayer and learning for the Jewish, Christian and Muslim communities, celebrating the three main monotheistic faiths and what they share and hold in common. The House of One is the product of a grassroots group. The initial idea came the parish community of St Petri-St Marien, which is working closely with the Jewish community of Berlin, along with the rabbinical seminary, Abraham-Geiger-Kolleg, and the Muslim initiative for dialogue, Forum Dialog e.V. 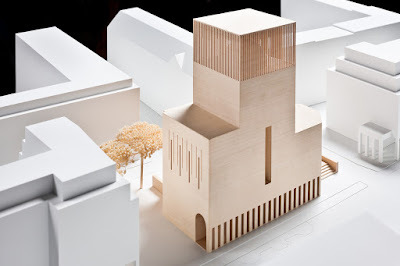 When it is completed, Berlin’s House of One will bring together a church, a synagogue and a mosque under one roof, in a house of worship shared by Jews, Christians and Muslims. The sponsors hope the House of One will help to tear down the walls between religions just as the fall of the Berlin Wall removed the barriers between East and West Berlin almost three decades ago. The House of One will be located at the Petriplatz (Petri Square) in the historical birthplace of Berlin, between Breite Straße and Gertraudenstraße. The Revd Gregor Hohberg, the Lutheran priest at the Marienkirche or Saint Mary’s Church, first conceived of the idea of an interfaith house of worship in 2009, when archaeologists excavating a section of ground on Museum Island unearthed the remains of Berlin’s earliest church, the Petrikirche or Saint Peter’s Church, and the city’s Latin school, dating back to 1350. The church was destroyed and rebuilt several times when the East German communist government decided to demolish the church in the 1960s, and more recently the site has been used as a parking lot. When the archaeologists excavated the area, they ‘quickly agreed that something visionary and forward looking should be built on what is the founding site of Berlin,’ says Pastor Hohberg. The House of One will be 40 meters tall, with a shared inter-religious space for 380 people at its heart, and a mosque, synagogue and church branching off in different directions. The Berlin architect Wilfried Kuehn of Kuehn Malvezzi GmbH has designed an interfaith prayer house that has three separate sections, each in a different in style but with certain repeating motifs to emphasise the similarities and the differences between the Abrahamic faiths. The communal room in the heart of the building linking the three areas and seating 380 people. Each of the worship areas will be the same in size but of different shape, allowing each faith to keep its own identity. The first three faith leaders heading the House of One project were the Revd Gregor Hohberg, Rabbi Tovia Ben Chorin, and Imam Kadir Sanci. ‘A place that has darkness in its past has the potential for peace in its future. As a Jew, I associate Berlin with memories of pain and deep wounds – but that is not the end of the story,’ he points out. ‘I believe in the power of dialogue. In the world we live in we have two possibilities: war or peace. Peace is a process and in order to achieve it, you have to talk to each other,’ Rabbi Ben-Chorin said. Imam Kadir Sanci, the House of One’s Muslim leader, said he wanted the project to encourage a conscious dialogue between different faiths and cultures, which would help prejudices against Muslims to evaporate. ‘We want our children to have a future in which diversity is the norm,’ he insists. He hopes the project will normalise relations between people of diverse backgrounds. ‘We want our children to have a future in which diversity is the norm,’ he says. The project is trying to make its dream a reality through a crowd-funding campaign for building the House of One. The goal is to raise €43 million and to finance the project entirely through crowdfunding, by selling bricks for €10 each. By donating €10 for one brick, you can become a part of the House of One. With every brick, every bit of support and with every person sharing the idea of the House of One, the dream comes one step closer to reality. As of today, €8,605,695 has been raised for 860.569 bricks, and building is to begin in earnest once the first €10 million has been raised.